Discussion in 'Electric Vehicles' started by Webeevdrivers, Aug 5, 2018. He is video from Saul. I can't remember seeing the placard colour coding in North America the way he describes it. Honestly I have never paid attention. The two we use for our leaf are at private businesses and neither is signed. Is this something that is more common in certain areas. Obviously that first line should have read, "Here is a video from Saul". Didn't catch it before the edit time expired. If a Destination Charger is supplied by Tesla, Tesla would include a red Tesla sign also. Some Destination Chargers are not free from Tesla and owners have to buy them, then a red Tesla Sign is not included. In this case, owners may put up a customized sign like a generic green sign instead. 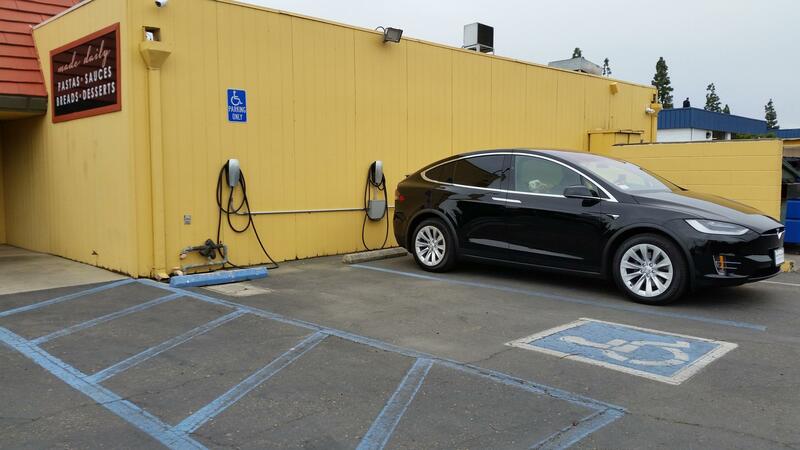 Some Destination Chargers are not free from Tesla and owners have to buy them, then a red Tesla Sign is not included. In this case, owner may put up a customized sign like a generic green sign instead. Thanks for the response. So obviously this coloured placard system is used in North America too then. I'll have to keep an eye out. Interesting. Most destinations are free from Tesla with its accompanied red Tesla signs. There are very few exceptions such as the below as my 2 dogs looking out the window and wondering what happened to red Tesla signs at La Piazza Ristorante Italiano, Tulare, CA near my home? Many of the signs and colors around EV charging locations in the US are green, for energy efficiency. But the implementation is completely up to the owner. The difference is that in Europe, Tesla uses the 7-pin Mennekes style connector, which is a standard connector which will fit other cars. In the USA, there's no such think as a Tesla destination charger which will connect to a non-Tesla car. Hence the different methodologies used. Yes but adapters are available. We have one. In one of the locations where we charge at a Tesla destination charger the business owner actually provides the adapter. Thanks for the info. I didn't realize that they didn't use j1772 in europe.